Tiger Woods is back in the winner’s circle after five years. The former No. 1 golf player in the world claimed victory at the 2018 TOUR Championship this past weekend at the East Lake Golf Club in Atlanta. Tiger Woods laid the groundwork for his lead from Thursday to Saturday, and on Sunday, his 1-over 71 gave him a two-shot win over Billy Horschel. This is Tiger Wood’s first win since 2013, having spent the last five years struggling with debilitating back pain including four back surgeries. It was clear that almost everyone for rooting for Tiger Wood’s comeback and this victory—his 80th career PGA win—was especially sweet for the 42-year-old athlete that used to dominate the sport. 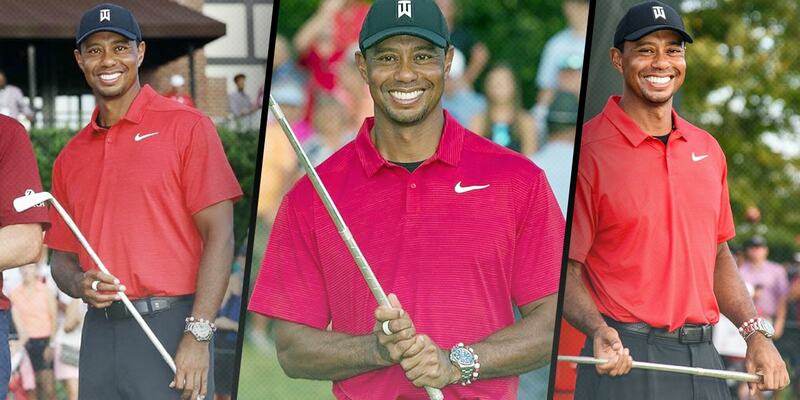 #Rolex congratulates @tigerwoods on his incredible season and winning return at the TOUR Championship, his 80th PGA TOUR title @playofffinale. While he’s been an official Rolex ambassador for years, Tiger Woods seems particularly partial to one Rolex model—the hefty Deepsea dive watch. In the past, we’ve spotted the stainless steel Deepsea ref. 116660 with the classic black dial countless times on his wrist. However, while Tiger Woods was clutching onto his 2018 TOUR Championship trophy (a replica of Bobby Jones’ putter Calamity Jane) on Sunday, we spotted what we believe to be the new Rolex Deepsea 126660 launched earlier this year at Baselworld. Tiger Wood’s watch had the famed D-Blue blue to black gradient dial, which Rolex created in 2014 in honor of James Cameron’s historic dive to the Mariana Trench. The new Rolex Deepsea “James Cameron” ref. 126660 on Tiger Wood’s wrist features the same sized 44mm Oyster case as the previous version, yet it has redesigned lugs and a thicker Oyster bracelet for improved proportions. The biggest change to the 2018 Deepsea lies beneath the case with a new self-winding Caliber 3235 charged to power the watch. The unique Ringlock architecture of the thick Deepsea case provides the watch with an incredible water resistance rating of 3,900 meters (12,800 feet), while the Cal. 3235 offers a generous 70-hour power reserve. A powerful watch for a powerful athlete. Congratulations to Tiger Woods on his awesome win and we look forward to watching him continue on his comeback journey!